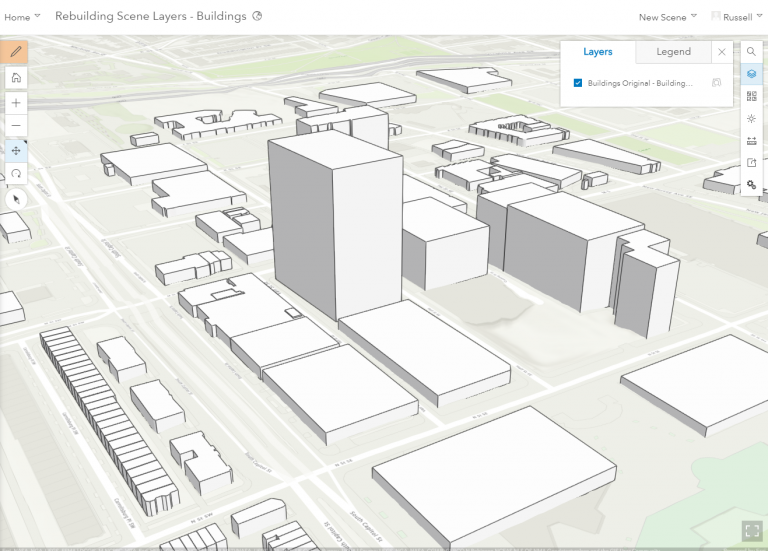 In ArcGIS Online you can publish hosted scene layers with an associated feature layer. To learn about how you can publish scene layers with an associated feature layer, read this blog. 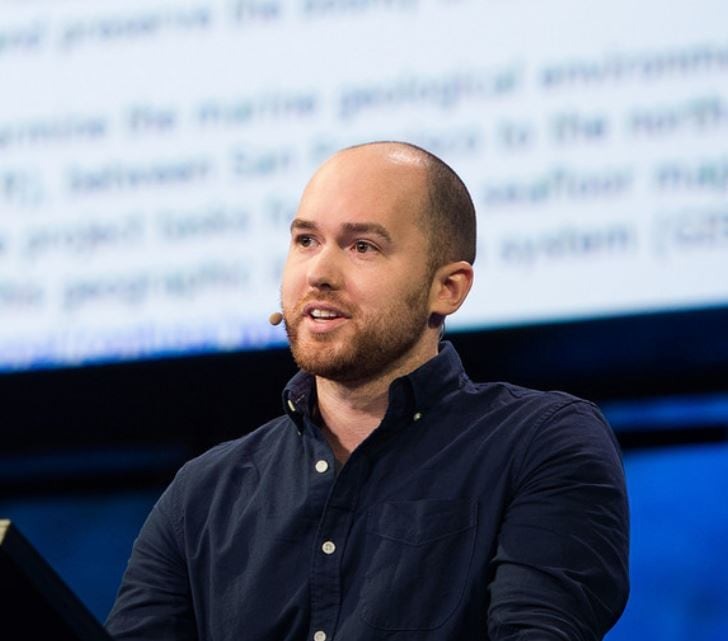 When your scene layer has an associated feature layer not only can you use it to display configurable popups and feature search for the scene layer, but it can also be used to apply changes to the scene layer without impacting any web scenes or apps using the layer. 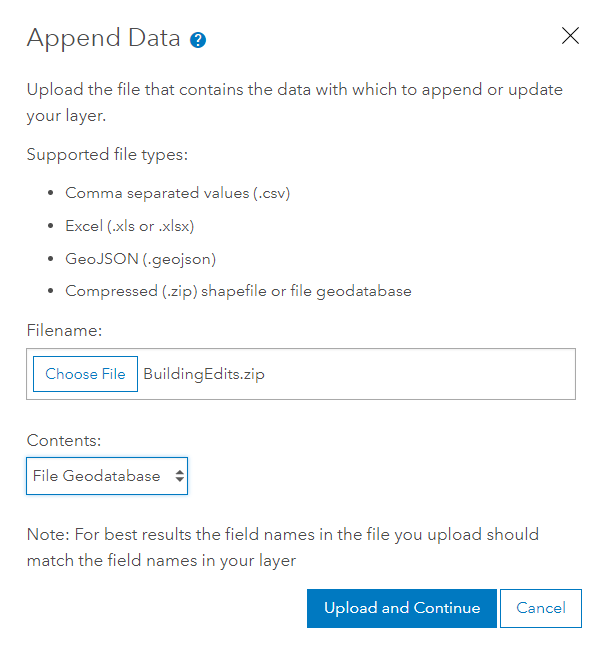 In this blog I am going to walk through how you can rebuild your scene layers to pick up schema and data updates in ArcGIS Online. In this example you have a 3D Object scene layer with an associated feature layer showing building shells. With the multipatch feature layer we can use this to update the existing features with the Update option on the feature layer item details page. Below is a 3D Object scene layer in a web scene. The feature highlighted is the building that has undergone reconstruction and is now a skyscraper. This building needs to be updated in the scene layer to show this change to the downtown area in the scene. To get the building updated we will need to go to the feature layers item detail page and click the Update option on the right hand side of the overview tab. Clicking on the Append Data to Layer option will display the modal view where we will upload the updated data. In the geodatabase I am using only contains the one building that has the change. 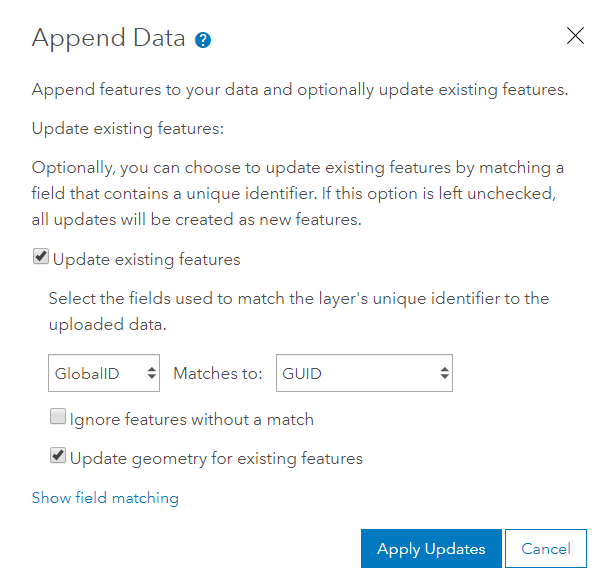 Next choose the option to Update existing features and in this case I am matching the GlobalID from the Feature Layer to the GUID in the uploaded feature class in the gdb and click Apply Updates. Now go to the scene layer associated to this feature layer. You can quickly go to the scene layer linked to this feature layer by clicking on the link to it in the Details section of the item details page for the feature layer. On the scene layers settings tab at the bottom of the page click on Manage Cache. This will bring up the rebuild options available for this scene layer. For this case the scene layer is only picking up edits and no schema changes. This means the scene layer will use the second option in the dialog to pick up attribute and geometry changes. When ready to begin the updating process click Rebuild Cache. If this scene layer had multiple layers and only one of the layers was edited we could select just the edited layer, this will then only rebuild features in the selected layer and not require the same number of credits to rebuild the entire layer if there were multiple layers in the scene layer. Once the rebuilding of the cache is completed, the web scene being viewed just needs to be refreshed in the browser. This is because we did not need to republish any content so all the reference to the layers in the web scene are the same and content does not need to be added back into the web scene. In the image below you can see the new building is much taller and all other buildings look the same. For this next scenario a point scene layer with an associated feature layer can have the feature layers schema updated after the layer has been published. The scene layer may need to pick up the schema changes to be used for smart mapping or filtering in Scene Viewer. The steps to update the point scene layer are very similar to the example above. With this example the feature layer has already gone through changes like adding or deleting fields on the feature layers item detail page. After the schema changes on the feature layer have taken place, go to the settings tab on point scene layer and click on the Manage Cache button. 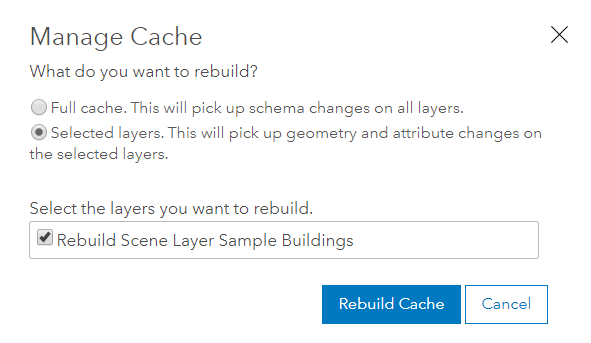 To pick up schema changes use the first option to rebuild the scene layer. To pick up these schema changes the scene layer requires a complete cache rebuild so you do not have the option to pick individual layers like you see with the option to pick up geometry and attribute changes. After the scene layer cache has completed being updated, simply add the scene layer to a web scene or refresh an existing scene and you will see the updated attributes available for you to use in Scene Viewer. The ability to rebuild your scene layers is a great way to keep all of your data up to date without having to recreate web scenes or make changes to your apps. 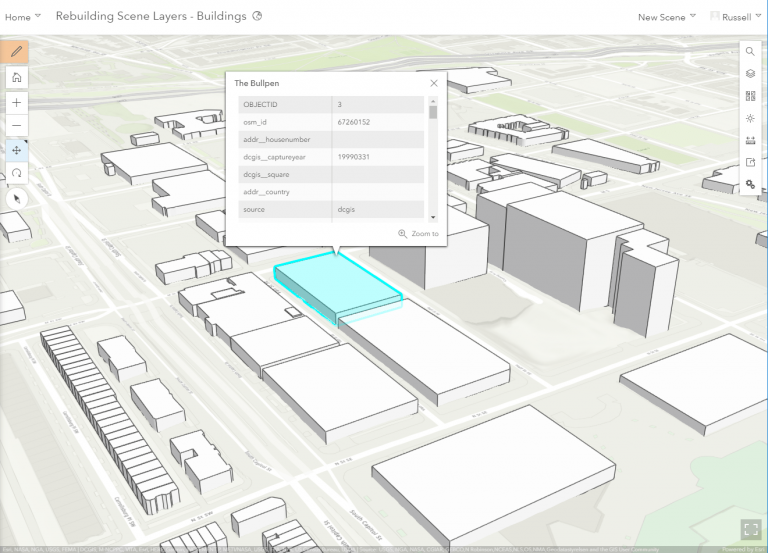 If you haven’t checked out the December 2018 release of Scene Viewer, check out this blog cover that release which included the ability to filter features and support for the new Building Scene Layer.